Assam State Warehousing Corporation (ASWC). Educational Qualification: BCA/MCA, having knowledge of day to day office operation using MS-Office. Minimum 2 (two) years experience is required. Age : Candidates must not be more than 38 years of age as on 31.09.2017. Age relaxation for SC/ST/OBC candidates as per Govt. rule shall be applicable. How to apply: The candidates who fulfill the requirements may attend the walk in interview along with curriculum vitae and original documents ( self attested photocopies of Certificates of qualifications ), Experience certificates , Mark sheets , Birth certificate, Caste certificate (in case of SC, ST and OBC),( two passport size photographs for submission at the time of interview) . The candidates, if employed in any Govt. or the Private sector Companies may bring NOC from their employer for submission at the time of interview. The candidates shall report for Walk in Interview at 10.00 a.m. positively. No TA/DA will be admissible for attending the “Walk in Interview”. 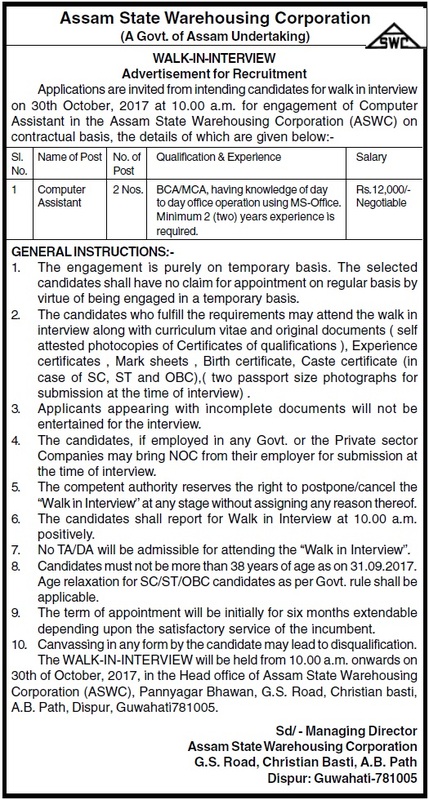 The WALK-IN-INTERVIEW will be held from 10.00 a.m. onwards on 30th of October, 2017, in the Head office of Assam State Warehousing Corporation (ASWC), Pannyagar Bhawan, G.S. Road, Christian basti, A.B. Path, Dispur, Guwahati781005.